With code examples for both, and a video where I write code using these annotations. You can download the complete sample application from GitHub if you like. The class is pretty simple: its contract stipulates that it echoes whatever is passed, unchanged. In true Test-Driven Development (TDD) style, you’ll write the implementation after you write the unit tests. Use this annotation to tell the JUnit platform not to run this test method. Notice that the method is annotated with the @Test annotation. Normally, JUnit would execute this method at the appropriate point in the test lifecycle, but annotating the method with @Disabled tells JUnit not to run it. Why not just remove the @Test annotation? It might be good for documentation purposes to leave it annotated with @Test so you know it was a test method, or maybe you just want to temporarily disable the method. This is a super cool new feature of JUnit 5 that allows you to create nested (inner) classes that keep groups of tests together in the same main test class, but separate from the other test methods in that class. And that would work just fine. But JUnit 5 and the Jupiter API give you the @Nested annotation. So let’s use it! In the video below, I’ll go over these annotations in detail, and you can watch me explain the code as I write it. In this article, I showed you some of the annotations from the JUnit Jupiter API you’re most likely to use. But there is a LOT more to JUnit than the Annotations. Be sure to follow along with this series here on my blog, and the accompanying videos on my YouTube channel. To learn more about the annotations provided by the JUnit Jupiter API visit the JUnit 5 User’s Guide. Check out the first post in this series here. Hey everybody! In this post, I’d like to talk about Container-centric infrastructure with Kubernetes. This is Part 5 of a series of posts on using installing and using Kubernetes. If you missed Part 4 where I give you Install Kubernetes on your Computer (Minikube), make sure to check that out. When Kubernetes starts a pod it’s isolated in its own network. So how do we interact with the application? One way is through a proxy, which you can start in a separate terminal window. Start a new Terminal window and execute the kubectl proxy command. By default the proxy uses port 8001, but you can specify a different port using the --port option. This starts the proxy using port 8080. Now you can connect to the cluster through port 8080 on your computer. I’ve written a script to get the pod name and use it to access the application through the cluster’s REST interface. The script is called test-k8sdemo.sh and takes the port as an argument. And there you see the output. Now that we have an app up and running, let’s talk about how to manage it. You can use the kubectl command to get information about pods, deployments, and so on. This produces a lot of output, but it’s valuable (if somewhat verbose) information. Now I love the command line as much as anybody, but did you know that Kubernetes has a Web-based UI dashboard? Paste the above command into the console to deploy it. Once the Dashboard is deployed you can access it from http://localhost:8001/ui. Well, that’s it for this series. I hope you enjoyed it, and make sure to check out the video below that walks you through everything I covered in this blog series (it’s true what they say: a video is worth a thousand pictures!). If you want to learn more about Kubernetes, check out this post at IBM developerWorks: What is Kubernetes? Hey everybody! In this post, I’d like to talk about Container-centric infrastructure with Kubernetes. This is Part 4 of a series of posts on using installing and using Kubernetes. If you missed Part 3 where I give you Install Kubernetes on your Computer (Minikube), make sure to check that out. Open a Terminal window or command prompt, navigate to a location on your computer where you want the code to land and clone the code from GitHub. Now run the application in Node. Open a browser and point it to http://localhost:8080 to see the message. And there it is. Now that you have an application, it’s time to containerize it. Use this Docker definition to containerize the application. But before we can do that we need to start minikube, and I’ll show you why in a minute. The first time Minikube runs, it has to download the ISO image to run inside of VirtualBox, and may take a minute or two depending on the speed of your internet connection. Once the image has been downloaded, minikube will start. Otherwise Docker will use the local registry on your machine, which is not accessible from the VM where minikube is running. docker build -t k8sdemo:v1 . This will create the image with a name of k8sdemo and a tag of v1, and store it in the Docker registry on the minikube host VM. When deploying the image to Minikube, you’ll reference that tag explicitly. And now the application is up and running in its own Pod. In this post I showed you how to work with Kubernetes on your computer. You containerized a simple application, then deployed it to your local Kubernetes cluster. 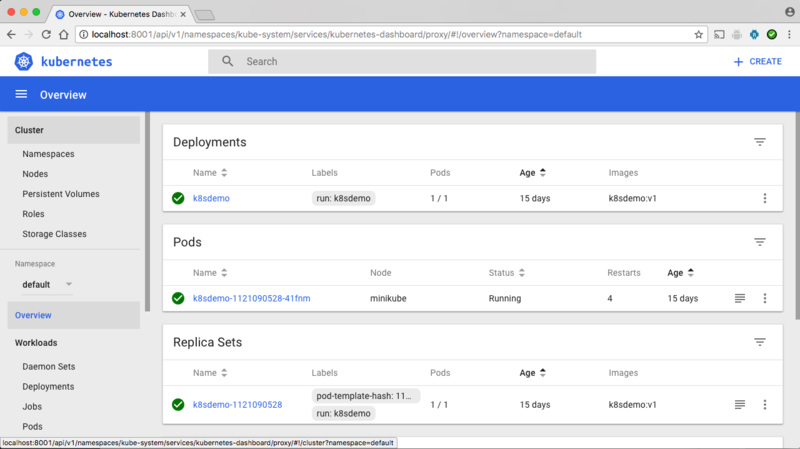 In Part 5, I’ll show you how to manage an application running in a Kubernetes cluster using kubectl and the Kubernetes Web UI Dashboard. Hey everybody! In this post, I’d like to talk about Container-centric infrastructure with Kubernetes. This is Part 3 of a series of posts on using installing and using Kubernetes. If you missed Part 2 where I give you Kubernetes Overview, make sure to check that out. In this post, I want to walk you through installing the software you need to run Kubernetes on your computer. First, you need Docker. You can find instructions for your platform by clicking this link. If you already have Docker installed, skip to the next section. Scroll down until you see your platform, which is MacOS in my case, so I’ll click on Docker for MacOS. I want the distribution from the Stable channel, so I click on the link that says Get Docker for Mac (Stable). Always verify the 256 bit SHA checksum of the downloaded file matches what is published. Now double-click the DMG file to begin the installation, and follow the instructions. Minikube requires a virtualization environment in order to run. If you want to use software other than VirtualBox, check out the Getting Started with Minikube page at kubernetes.io. If you already have VirtualBox installed, skip to the next section. To install VirtualBox, go to the VirtualBox installation page, and click on the link that matches your platform. ALWAYS verify the SHA256 checksum matches the downloaded file. In order to test the demo application, you’ll need Node.js installed. I already have Node.js installed on my Mac, so I’ll skip that for the video. Make sure to check out the Node.js installation page. If you already have Node.js installed, skip to the next section. Click on the download link that matches your platform, and follow the instructions. Go to the Minikube page at GitHub, and look for Installation. I like to use Homebrew to install software on my Mac. If you’re using Linux or Windows, the Minikube installation page has instructions for those platforms as well. Homebrew installs Minikube and now it’s ready to go. Yes, it really is that easy (on MacOS anyway). Now you have all the software you need to work with Kubernetes on your computer. Stay tuned for Part 4, where I’ll show you how to work with Minikube and define an application, deploy it to your local k8s cluster. In order to run JUnit tests, you need to tell the JUnit Platform about your test classes: which methods are test methods, which methods are part of the test method lifecycle, whether to use extensions, and so on. You do this through annotations, which are metadata about how to run your tests. In this post, I’ll cover the two annotations you’re likely to use with JUnit, along with examples of each. Use this annotation to tell the JUnit platform that the method is a test method. This means it will be invoked at the appropriate point in the lifecycle, complete with all the bells and whistles. Every method you want to run as a test method needs to be annotated with the @Test annotation. By default, the name displayed for a test class or method is the name of the class or method, respectively. The @DisplayName annotation tells JUnit to use the specified name instead. In the video below, I’ll go over the annotations in detail, and you can watch me explain the code as I write it. In this article, I showed you two of the annotations from the JUnit Jupiter API you’ll definitely want to use. Stay tuned for more in this series, where I’ll show you more annotations from the JUnit Jupiter API. The Assertions class of the JUnit Jupiter API is the GO-TO for testing your code. After all, how do you check a condition without an Assertion? I’m doing a multi-part series on the Assertions API on my YouTube channel (Makoto TV), so make sure and check it out. In Part 0, I show you how to get the code that accompanies all of the videos, and get your Eclipse workspace setup. Make sure and check it out. Welcome to Java News and Code, where I tell you about interesting goings-on in the world of IT in general, and Java in particular. On August 17th, Oracle Software Evangelist David Delabassee said Oracle wants to open up Java EE. Java EE Guardians’ members include James Gosling, the Father of Java, and Cameron McKenzie, editor-in-chief of the Server side. It’s not clear what qualifies someone to be a Java EE Guardian, but qualifications span the spectrum from Father of Java, to Java Blogger, to this Java EE Guardian, whose qualifications include Student. So who will take over Java EE? Responses to an unofficial Twitter poll by Java EE Guardian Reza Rahman asking that question seem overwhelmingly in favor of handing stewardship of the platform over to Apache. So what does this mean for Java EE? It depends on whom you ask, but given the popularity and prevalence of the platform, I’m sure it will stay in good hands. Be sure to check out the show notes page, where you can find more information on this story, and everything I talk about in this episode. We’ve been following Android O for some time now here at Java News and Code, and at long last, Android O, named Oreo, has been released! For users, Android Oreo has a bunch of new features, some of which are immediately obvious like picture in picture, and per-app notification options. Other changes like background limits, are designed to improve device responsiveness and extend battery life. For developers, things get more complicated. The optimizations and improvements come at a cost, which will be paid on the development side. And rightly so. What does that mean for developers like me, who have apps in the Play Store? For now, probably not much. Oreo is not even showing up on the Android Dashboard as of today, but of course, it’s only a matter of time. Android Marshmallow has the single greatest share of installations, and it was released in October of 2015, coming on two years. So we have time. But as developers we need to be ready. Fortunately, there is information available already to help us get ahead of this, like this video on the Android Developers YouTube channel. This release is huge, there’s no denying it. And in my opinion totally worth it. Check out this article at Gizmodo, that lays out 11 cool new features in Oreo. On August 24th, JUnit 5, Release Candidate 3 was released. This release, which signals the impending General Availability (GA) Release, includes the usual spate of bug fixes, breaking changes, and new features. The GA release is scheduled for September 6th, according to the milestones page. A Maven archetype is a special type of Maven project that is used to generate other Maven projects. If you’ve ever used the New Project wizard in Eclipse to create a Maven project, chances are you’ve used the maven-quick-start archetype. Guess what? That’s a Maven archetype! For this episode’s code talk through, I want to show you how to create a Maven archetype that you can use to create new projects that will come with JUnit 5 dependencies and boilerplate code. The source code for the archetype is available in GitHub. And in this episode I want to do a quick walk through of the code for a Maven archetype, how it’s structured, and how to use it to generate a new project. Next, import the code into Eclipse. With the code in Eclipse, let’s take a quick tour. Expand all of the nodes in the source tree. Open the src/main/resources/META-INF/maven/archetype-metadata.xml file, which tells the archetype generator what source files, test source files, resources and so forth you want to be included in new projects generated from the archetype. And the POM file that will be included in any projects created from the archetype, src/main/resources/archetype-resources/pom.xml. To use the archetype to create new projects, you first have to build the archetype project itself. Like I said, it’s a Maven project, so to build it go to Run As > Maven Project and specify the install and archetype:crawl goals to install it in your local Maven repository, and update your local archetype catalog, respectively. Next, make sure the archetype is included in your local Maven archetype catalog, which is located in the repository root in a file called archetype-catalog.xml. And there it is. Now, I can use that to create projects in Eclipse. First, make sure Eclipse recognizes the local maven catalog. Under Preferences > Maven > Archectypes, click on Add Local Catalog. Browse or enter the path to your local archetype-catalog.xml file, give it a description you’ll recognize later, click Ok. Then Click Apply and close. To create a new project based on the new archetype, go to File > New Project > Maven Project. Click Next. Click Next again. Select the archetype in the list, and complete the wizard. When the wizard completes, you now have a new project based on your custom archetype! For a detailed walkthrough of this, check out this video. Well, that’s it for today’s episode. Be sure to check out the show notes page, where you can find more information on this story, and everything I talk about in this episode. Thanks for watching Java News and Code (and reading this post).